I learned that abortion was wrong before I learned what abortion was. I later learned that abortion was murdering an unborn child. I learned both of these things from Christian rock songs. A typical example was “Who Will” by DeGarmo & Key, from their 1989 album “The Pledge”, which I found for £1 in a Christian bookshop bargain bin in about 1992. I was seven at the time. I never actually liked “Who Will” very much, but I heard it a fair bit because my dad played the whole album in the car. He never talked to me about the lyrics or what the meant, but I took it that everything therein had his approval since it was Christian and he kept playing it. 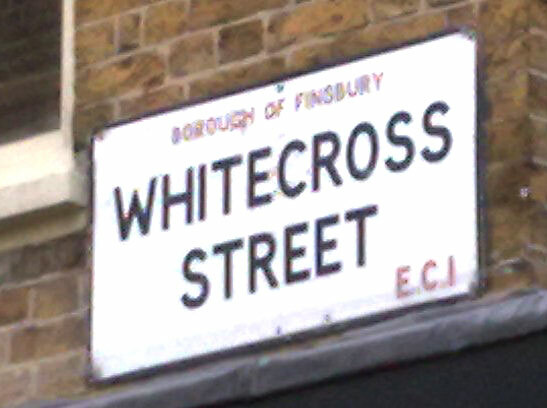 For a while, Whitecross were my favourite band. I was a bit late to the scene (they were at their peak when I was still learning how to use a toilet), but they had actually been a lot of Christian kids’ favourite hair metal band. Their lead vocalist, Scott Wenzel, sounded almost exactly like Stephen Pearcy from Ratt. In 1987, this was a major selling point. Ratt were a platinum-selling band, but conservative Christian parents wouldn’t let their kids listen to them. Solution: Whitecross. My love of the band meant I spent my childhood getting unreasonably excited by signs like this. Unlike most Christian versions of secular bands, Whitecross were pretty good (by the standards of a genre which critics universally regard as the nadir of rock n’ roll). I think By Demand, a compilation of Whitecross bangers, might be a better listen than Ratt’s best-of Ratt & Roll 81-91. Whitecross axeman Rex Carroll compares pretty favourably to 80s guitar heroes like Dokken’s George Lynch. And Whitecross definitely have more good songs than Dokken (which is to say, they have some good songs). Of course, I had no idea at the time that Whitecross sounded like Ratt and Dokken because I wasn’t allowed to listen to those agents of Satan. Anyway, the Whitecross song I have chosen to dissect is “No Second Chances”, which isn’t necessarily one of their best. It’s here because I find it disturbing. So as you probably gathered, this song relates Jesus’s parable of the rich man and Lazarus. As hard rock lyrical fodder, this is—as Bill & Ted would say—most atypical. This is the first installment of my series on Christian rock. Read the introduction here. Carman was where it all began for me. Before my family discovered Carman, Christian music was tedious, church was boring, and there’s an excellent chance I would have looked for entertainment in secular culture. After Carman, being a Christian seemed exciting, like something I wanted to do for myself rather than just something I did because it was my duty as a member of my family. Compared Michael Jackson, Carman was not fantastic. But, at least in my case, Jackson was not really the competition (although I had heard “Black or White” at school and it was the greatest thing I’d ever heard) (proper school, that is, before I went to the ACE school). Carman’s competition was Graham Kendrick and Don Francisco, and had I known the term and been allowed to use it, I would have told you that those guys sucked balls. The first Carman song I ever heard was “Radically Saved”. Today, governments are worried about the radicalisation of young Muslims and the Government spends millions on anti-radicalisation programmes. In 1991, I (aged six) began to think of the term as a badge of honour. Welcome to the first installment of a new series. When I named this blog “Leaving Fundamentalism” I really meant it to be a diverse examination of all the unusual parts of my bizarre Christian upbringing. In the end, mostly because of my PhD studies, the blog has been swarmed by posts critiquing ACE. Here’s a bit of light relief: Once a week I’ll show you a Christian rock song from my childhood and talk about how it affected me. People might be misled by this into thinking that ACE and Christian rock are somehow related. They aren’t, really. ACE is adamant in its opposition to Christian rock music. In fact, that was the first thing I disliked about ACE. Long before I realised how sexist it is, or how racist, and years before I noticed they’d been teaching me lies, I loathed ACE because they were opposed to Christian rock music, which for me was the biggest reason that I was enthusiastic about being a Christian. Competition arrangements are to be Christian or patriotic rather than secular. Classical instrumental music is allowed as long as it is non-offensive to Christian values or good taste. Music sung or played with a jumpy, sensual, or worldly style is not acceptable. Contemporary Christian, jazz, gospel rock, or gospel country music are not acceptable. In our music guidelines, “contemporary” refers to a style of music, not the date on which a piece was written. Music must be appropriate for a typical conservative fundamental church service (musical arrangement, text, and presentation). This is a guest post by Kevin Long. I am officially heartbroken. I was walking around the neighborhood with my special needs kid. Trying to come up with a way to spend more quality time together, I said, “Let’s do a song on Garage Band or something.” The kid went tense. All the classic Creationist tropes are there. The biology teacher is short, ugly, intolerant, and has a nasal voice, while the Christian girl is blonde, wholesome, and attractive. While the nasty, hobbity teacher is probably stolen from Mötley Crüe’s “Smokin’ in the Boys Room” video, the video’s plot is straight from the infamous anti-evolution Chick tract, “Big Daddy?” This is slightly ironic, since Chick tracts claim that Christian rock is demonic. Anyway, you can learn all this and more in my post, so go and read it! You can also check out Laughing in Purgatory on Facebook. Related post: Christians rock too! There’s a simple reason why Christian rock music is never going to be convincing: rock n’ roll is about rebellion, and evangelical Christianity is about obedience. The initial fundamentalist response to rock music was to ban it entirely. In fact, that’s still the diehard fundamentalist position. One of the main differences between evangelicals and fundamentalists is that evangelicals allow Christian rock music, whereas fundamentalists say the whole style is inherently ungodly. 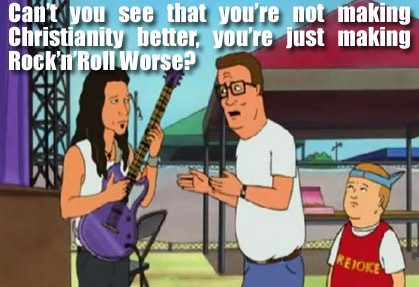 After a while, when it became obvious that banning rock music was not going to work, some Christians started using it as a tool for evangelism. There was a lot of fairly decent Christian rock that sounded like Journey and Bon Jovi. That makes sense because those bands are already inoffensive. It says a lot about evangelicals that there is even a market for Christianised versions of a band whose biggest hit is called “Don’t Stop Believing”. Evangelical rock is for kids whose parents won’t let them listen normal music. It exists purely as a mechanism of control. The bands probably wouldn’t put it that way, but even the ones who claim to preach the Gospel to ‘the Lost’ actually play to Christian audiences. As a child in the early 90s, I was curious about Guns n’ Roses, Michael Jackson, and Def Leppard. Listening to them was out of the question, so instead I had Bride, Carman, and Petra. They weren’t as good, but because I almost never heard the real thing, I didn’t know that. If I listened to secular rock music, evil spirits in the music would lead me away from God and into a life of sin.